vittadhE – Look at our true nature!!! uLLa padi uNaril: This phrase literally means, “if we were to know and realize the true nature of a soul”. thiruvaLLuvar says “epporuL eththanmai thAyinum apporul mei poruL kANbadhu aRivu”. This means that knowledge/intelligence is nothing but knowing the true nature of the soul. When we look at our world, we perceive things as living things, non-living things. Within that we tend to differentiate it as human, animal, plants etc. We do not perceive the soul that resides in it. A truly knowledgeable person never sees the peripheral characteristics such as the living/non-living nature or the category/sub-category within it. He sees the true nature of the soul that is inside them. However, it is not very easy to know and realize the true nature of a soul just by ourselves. We should know it with the help of shAshtrAs. A soul is made of knowledge that we would like to call “conscience”. A soul is personified by conscience. In addition to this, a soul possess the character called “conscience”. Our scriptures thus describe the soul as (a) that which is nothing but complete conscience and (b) that which possess conscience. So, a soul inherently has the arrogant nature that “I am the one that does this”. If we were to look into this statement carefully, we can unearth something interesting. The souls, though it may be conscience personified etc., it cannot act and do things by itself. It needs someone to guide/enable it to work. That someone is none other than sriman nArAyaNan who is present inside the soul and thus acts as the “soul of the soul”. Hence, sriman nArAyaNan is the soul and the so-called soul becomes the body in which sriman nArAyaNan manifests HIMSELF and guides the soul. Hence, the soul that we know of cannot act on its own. Thus, this soul is only subservient to sriman narAyaNan only and forever. The quality of being a servant to the eternal master sriman nArAyaNan is the real nature of the soul. If one were to realize this, then there is nothing that he needs to do in order to protect himself. thiruvaLLuvar said “iyalbAgum nOnbirka onRu inmai udaimai mayalAgum maRRum peyarththu”. This means that the state of rishis are such that they realize the fact that there is no one else apart from sriman narAyaNan who can be the target of attainment. Without this, if we think that we have something else to attain, then that very thought itself becomes the cause for our rebirth. onRu namakku uNdenRu viLLa viragiladhAi vittadhE: This phrase means that we cannot open our mouth and brag about not even one thing on our hand that can get us moksham. “viLLa” would mean “to say”. There is yet another connotation to this word as in “viLLa vilagi niRka”. This would refer to the condition of a person who cannot even say that he has his own way to protect himself and so does not need to take refuge under sriman nArAyaNan’s lotus feet. The state of this person who tries to keep himself aloof yet could not do so is what is referenced by “viLLa vilagi nirka”. The basis for this connotation stems from the fact that all the souls act as the body of sriman nArAyaNan and that HE is the actual soul who resides in the body that is made of so called souls. A body cannot function without the support of the soul. “oh paramAthmA! Please protect me”, paramAthmA can act upon this and shower HIS divine grace? If HE expects something before HE can shower HIS grace, then that by itself becomes a “fault” for HIM. In addition, we on the other hand, have nothing to give in the first place. This is explained in the ensuing paragraphs. koLLa kuRai yEdhum illAdha yAm: The body that we have and the soul inside it are all possessions of sriman nAraAyaNan. The body and the soul does not have the ability to function independently. They do not have anything as its possession. So, HE does not expect anything from the body or the soul. This point is being illustrated with a story. Once upon a time, there was a person who went up to sriman nArAyaNan and said, “Hey Lord! What do I give you? I do not have anything because I am your servant. Whatever things that is deemed as mine are not mine, rather it is yours. Hence, I do not have anything to offer YOU. However, I do have something that I can offer. Those are nothing but the karmAs that I have accrued for eons together. I have that and I can probably offer YOU that. Apart from that, I do not have anything. There is a chapter in SrirAmAyaNam concerning bharatha and sage vashishta that is being dealt here. Sage vashishta told bharatha, “Hey bharatha!!! sri rAma had gone to forest. Your father dasaratha had reached heaven. So it has be you who should rule the kingdom”. 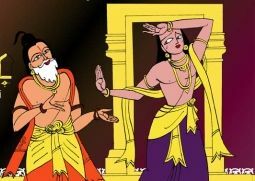 Hearing this, bharatha closed his ears with his hands and uttered, “You said sri rAma had gone to forest. If so, can I take the kingdom, which is HIS possession? If one usurps other’s property, then that is a theft”. bharatha based his arguments based on the likes of scriptures that say “uLLaththAl uLLalum thIdhE piRan poruLai kaLLaththAl kaLvam enal”. Even after this, sage vashishta did not leave him. He continued, “Since sri rAma is not here now, you can take the kingdom that is HIS possession, until HE returns”. bharatha replied, “It behooves an owner to own his belongings. A belonging/possession should not take another belonging. Me and kingdom are both belongings of sri rAma. Hence, I should not take kingdom”. Even after listening to his, vashishtA did not leave him. He continued, “Kingdom is something that does not have conscience. However, you are not like that. You do have conscience and knowledge. So, you, the one who has knowledge can take over the kingdom, the one that does not have any knowledge. I shall give you an analogy to this. A person has lot of jewels. He keeps them in a box and locks it for safety. The box safely protects the jewels. However, both the jewels and the jewel box are the properties of the person. But you can see that the box protects the jewels in it. Similarly, can you, who is a property of sri rAma protect the kingdom, that is also a proprerty of sri rAma? bharatha responded, “svAmi. In the analogy that you gave, both the properties are non-living objects that does not have conscience. The box does not have the knowledge that the jewels are to be worn by the owner. Since it does not have any knowledge it is doing what it is doing. However, I do have the conscience and thus that is exactly why I cannot take control of my master sri rAma’s possessions. Both myself and the kingdom are properties of sri rAma. However the fact that I differ from the kingdom by having the knowledge that the kingdom does not have. I do have the knowledge that I am subservient to my master sri rAma that the kingdom does not have. Hence, I need to stand by that knowledge and be truthful to that and exhibit the qualities of an owned/property. vashishta could not argue after that and accepted bharatha’s argument. This goes ahead and proves the point that even though jIvAthmAs have knowledge, the knowledge is only good when the jIvAthmA realizes the true nature, that is nothing but to be servant to lord sriman nArAyaNan. After realizing the true nature, there is never a time when one can say “I” or “mine”. Having these in mind, aruLALa perumAL emberumAnAr says that sriman nArAyaNan is complete. HE does not need anything to make HIM complete. On top of it, the jIvAthmAs have nothing that they can call it as “theirs”. So, there is absolutely nothing that they can give HIM. So, taking these two, we can see that HE does not accept anything and we (jIvAthmAs) cannot give anything. aruLALa perumAL emberumAnAr asks the people who are nearby, “what do you guys say of this”. Here the word “nAm” in “iRai yEdhum illAdha yAm” includes aruLALa perumAL emberumAnAr and the people who are before him and the rest of all others except perumAL sriman nArAyaNan. The word “iRai” above would means iota and so “iRai yEdhum” is without an iota. The usage is similar to “agalagillEn iRaiyum enRu” where it means “even for a fraction of second (an iota of time), piRatti will not leave perumAL”. If one were to examine the true nature of the soul, then the characteristic features are (a) being the property of perumAL and (b) because of owner-owned relationship with perumAL, there is nothing that needs to be done by the soul (that is the owned here). HE is complete in all aspects and so HE does not require anything from anyone to make HIM complete. A beggar has nothing to offer a wealth person who has everything. The wealthy person does not need to go to a beggar and grab his money in order to make him wealthier. So, what can a jIvAthmA give? What can paramAthmA take? The answer is no for both questions. So, having realizing this truth, it behooves a jIvAthmA to know this truth and live by it. The jIvAthma needs to know that it is a property of perumAL and so will have nothing to offer/do on his part. The owner will take care of everything. To lead a life like this is the duty of a person. This is the essence of the second / middle phrase in thirumanthram, namely “nama:”. At this juncture, we should think of the following chUnikais from srivachanabhUshaNam. “palaththukku Athma gyAnamum aprathishEdhamumE venduvadhu. allAdha pOdhu bandhaththukkum pUrththikkum koththaiyAm”. There are couple of chUrnikais that are “anthima kAlaththukku thanjam, ippOdhu thanjamen enRa ninaivu kulaigai enRu jIyar aruLich cheyvar” and “prApthAvum prApaganum pRapthikku ugappAnum avanE”. There is a story to go with the essence of these chUrNikais. nanjIyar went to one of his sishyas who was in his death bed. The sishya was glad to see his AchAryan nanjIyar and asked him of anything that he should tell in his last moments. nanjIyar replied, “We all are properties of perumAL sriman nArAyaNan. Only the owner should think about ways to protect HIS property and not the other way around. We should never do anything to protect ourselves, be it today or be it during the last moments of our lives. The very thought that we should do something to protect us should go off completely. Only then, sriman nArAyaNan comes to our rescue. Until that point, how much ever a person tries on his part to do something or the other, it is futile and would get him nowhere”. In srirAmAyaNam, when the rishis met srirAma at the forest, they regarded themselves as babies that are inside the mother’s womb. The reason is that all the actions of the baby inside the womb are under the control of the mother who protects the baby. Likewise, the rishis said that they are under the protection of sriman nArAyaNan. So the activities of a jIvAthmA are not bound by itself but by paramAthmA. This is what is being referred as “pArathanthriyam”. Sometimes, it is being referred as “achithvath pArathanthriyam” to qualify it. This is nothing but the quality of a jIvathmA where by it is like a non-living entity that remains in the same position wherever we keep it. Similarly, the jIvathmA obeys and does not do anything on its own to protect it. It is completely dependent on paramAthmA and so it stays there wherever perumAL has decided to keep it at that point of time. thirukkOLUr peN piLLai ammAL says “vaiththa idaththil irundhEnO bharathAzhvAnaip pOlE”. kulasEkarAzhvAr says “padiyAik kidandhu un pavaLa vAi kANbEnE”. If a person (soul) is in this state, then perumAL out of HIS volition, comes and rescues this person. Our ancestors use the story of what happened at the seashore to corroborate this point. There were umpteen number of monkeys at the seashore that were destined to guard sri rAma and sri lakshmaNa. They talked amongst themselves that they should guard sri rAma and sri lakshmaNa from the attack of demons. However, as the night grew old, the monkeys could not resist their sleep and dozed off gradually. It was sri rAma and sri lakshmaNa who circumambulated these sleeping monkeys, with bow and arrow in their arms and protected them. Hence, the point is that it is the duty of lord sriman nArAyaNan to protect HIS possessions. It is the duty of a jIvAthmA not to obstruct the protection that is given by the lord.